Founded in Montreal, Quebec in 2002, the Canadian company Les 7 Doigts de la Main is a unique and innovative collective. The seven individuals also known as “The Fingers” are much more than circus artists, demonstrating a level of skill impossible not to applaud (El-Husseini). The combination of brilliant technique, raw artistry, and human vulnerability is achieved through the company’s simplistic vision. Les 7 Doigts de la Main seeks to bring circus to a human scale, presenting the extraordinary element of acrobatics in ordinary contexts. The integration of different art forms including music, dance, theatre, visual arts, cinema, and electronic media elevates the company’s performance (El-Husseini).With a number of ground-breaking shows the Canadian based company is definitely one to watch. Sequence 8, one of the most memorable performances at the Vancouver Push Festival, has been performed over four hundred times in fifteen different countries (Watts). Celebrating Les 7 Doigts de la Main’s tenth anniversary, Sequence 8 brings humour to the stage of dance. Set to multiple soundtracks, from Tosca to the Squirrel Nut Zippers, Sequence 8 explores dance sequences, acrobatics, aerial hoops, trapeze artists, juggling taken to gravity defying extremes, a seesaw double act, and a Russian bar routine that’s a cross between a trampoline and balance beam (Dunkel). The stage is composed of a wooden floor and seven uniquely sized mirrors, representing the reflective relationship between the performers and audience members. The use of both French and English texts by the performers represents the Canadian heritage of the company in a tasteful manner. Sequence 8 is not only technically outstanding, but artistically beautiful. With a sold out performance to a diverse audience at the Vancouver Playhouse, Sequence 8 has something to offer for almost everyone. Ann Pare, Sequence 8 – 7 Doigts de la Main, 2012, 470 x 280, Courtesy of Montreal Completement Cirque. Although each of these young performers possesses remarkable circus talents, the greatest accomplishment is their perceived ordinariness and human vulnerability. From the opening act the audience is immediately included in the performance. Colin Davis, one of the performers, turns his opening remarks about no photography and switching off mobile phones into a comedy routine (Watts). Personally I think that this is a great way to engage the audience in an untraditional yet effective way. Interaction with the audience is a reoccurring theme throughout the performance. For example, instead of having a standard intermission where the performers take a break from the physical demands of the piece, Sequence 8 redefines the term. Instead of separating the spectators from the performance, the performers began asking questions directed at the audience about the first half of the show. Not only is this a clever and humorous way of giving the audience a sense of recognition, it also allows the performers to rest for a few moments before the second part of the show. Continuing with this theme of interaction, performers of Sequence 8 went into the audience during the second half of the piece giving high fives and handshakes to audience members. One performer even kissed someone spontaneously. I appreciate the fact that this is an unscripted process that creates a unique dynamic and unpredictability to each show. Sequence 8 definitely breaks down the wall between spectators and performers, constantly engaging the audience members from start to finish. Due to the comfortable setting between the artists and the viewers, human vulnerability is highly present in Sequence 8. During the performance, the company employs circus spectacles to express elements of human life. 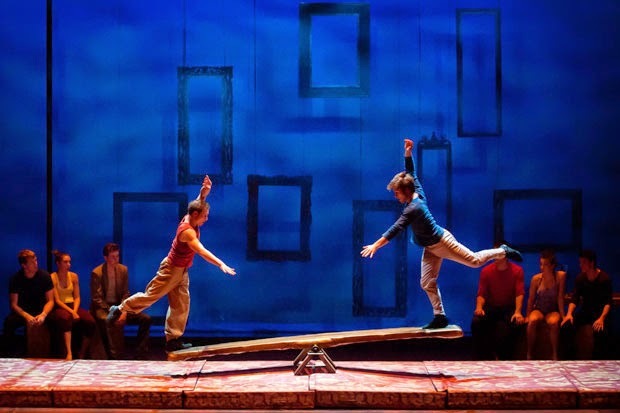 For example, in one act there is a teeterboard where two men are performing tricks on either side. In order for the circus trick to be performed correctly balance from both members is required; the search for balance in life is no different. Another metaphor that is present is the use of tape, symbolizing relationships between people. During this act a performer executes a number of aerial stunts while tangled in a web of people and duct tape. Like the tape, relationships are sometimes sticky; they can hold us together or restrain us from our potential (Dunkel). The significant intention and meaning behind the individual acts elevates the performance beyond fascination. Human vulnerability is also shown through the failures and repeated attempts at certain tricks. During the aerial hoop act, one performer accidently touched the hoop while trying to jump through it. The performers were very professional about the situation and immediately reset the trick to try again (Dunkel). This mishap in fact created a sense of realness, and took away the pressure of perfection that sometimes both the audience and performers expect. 7 Fingers – Sequence 8, 2015, 620 x 418, Courtesy of showbizdavid.blogspot.com. Furthermore, Les 7 Doigts de la Main’s simplistic vision and ordinary context is shown through costuming, lighting, and music. Unlike the famous circus company Cirque du Soleil, who are known for their elaborate costumes and spectacular staging, The Fingers prefer a stripped down version, involving regular jeans and basic props (Dessau). In Sequence 8 all the costumes were simplistic dance and athletic wear, allowing the viewers to focus mainly on the tricks being presented. The music was very conventional yet entertaining, another difference from the grand soundtrack of Cirque du Soleil. At one point in the piece, the performers created their own sound by using breath and hand gestures such as clapping. As for the lighting there were not many cues, and it was very one dimensional. By having simple surrounding elements viewers are able to focus on the complexity of the movement and acrobatics being presented. The minimalism offered in Sequence 8 allow for a more believable performance that the audience can relate to. Sequence 8, 2014, 3638 x 2420, Courtesy of http://www.frugalphillymom.com. 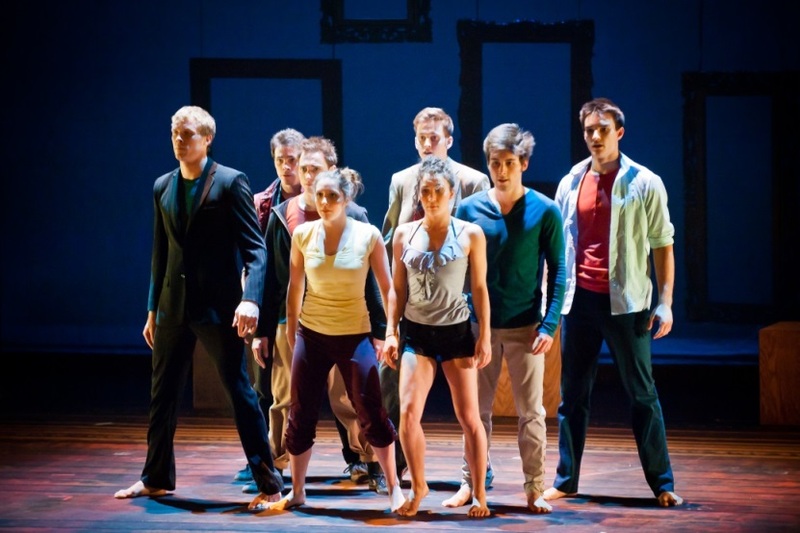 Les 7 Doigts de la Main’s Sequence 8 is truly an innovative and outstanding performance. Not only is the strength and expertise of the performers shown through a brilliant demonstration of acrobatics, but a great level of humanity is also present. By bringing the audience in direct relation to the performers, a more intimate and believable show is created. The ordinariness of the context along with the human qualities being presented, proposes a new perspective on the everyday. The combination of physical theatre, dance, music, comedy, visual arts, and cinema create an atmosphere way beyond that of traditional circuses. The Fingers continue to amaze viewers with their technique, artistry, and vulnerability, it is no surprise they are the new generation of circus artists. El-Husseini, Nassib. “Les 7 Doigts De La Main.” The Company. N.p., n.d. Web. 21 Feb. 2015. 19 Sept. 2014. Web. 21 Feb. 2015. <http%3A%2F%2Fwww.standard.co.uk%2Fgoingout %2Ftheatre%2Fthe-7-fingers-sequence-8–circus-review-9744114.html>. Dunkel, Ellen. “Review: Sequence 8.” Philly.com. N.p., 19 Sept. 2012. Web. 21 Feb. 2015.